One of my favorite South American dishes to make is ceviche. I LOVE it! For those of you who are not familiar with this dish and don't know what it is, let me explain. Ceviche is a dish made with different types of fresh fish marinated in citrus juices. This dish is not heated, so the idea is that the acid from the citrus juices (such as lemon or lime juice) will "cook" the fish by killing any bacteria. 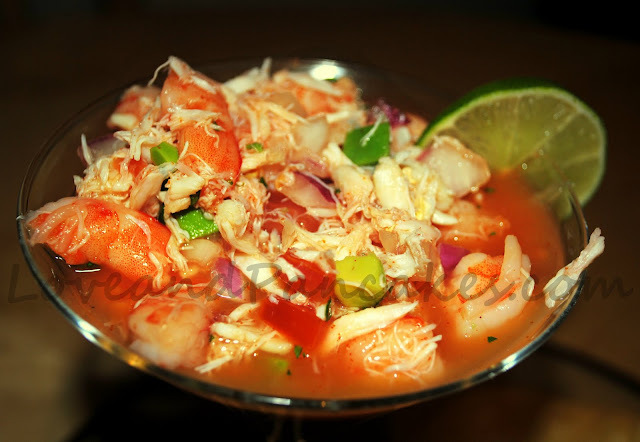 As of yet, I am not quite brave enough to try this dish with raw fish, therefore, I make my ceviche with pre-cooked shrimp and crab meat. I'm not talking about the artificial crab meat, either. If you are on a tight budget (which most of us are these days) than you can definitely use artificial crab meat, however, it will just not taste the same. Below you will find the recipe for my ceviche. Like I have always said, I don't follow a recipe when I cook so always be sure to taste as you go! You may want to add more lime juice for a more tart taste, or you may want to add more hot sauce to give the dish more of a kick. This is one of those recipes that's pretty hard to mess up so have fun with it 'til it comes out the way you like! Season steaks with salt and pepper. Spread mustard over both sides of steaks. Place the steaks in a large freezer bag. Add garlic, onion and beer. Let marinate for at least 30 min. Add all ingredients for ceviche in a large bowl. Toss so all ingredients are well combined. Place in refrigerator 'til ready to serve. Heat grill and place steaks on grill. Cook 'til desired doneness. While steaks are grilling, heat oil in a large, deep skillet on medium heat. Fry each tortilla in oil 'til golden brown and crispy. The food looks delicious. I made shrimp ceviche earlier this week. I find it light and refreshing. I love cilantro and lime. This looks so good! 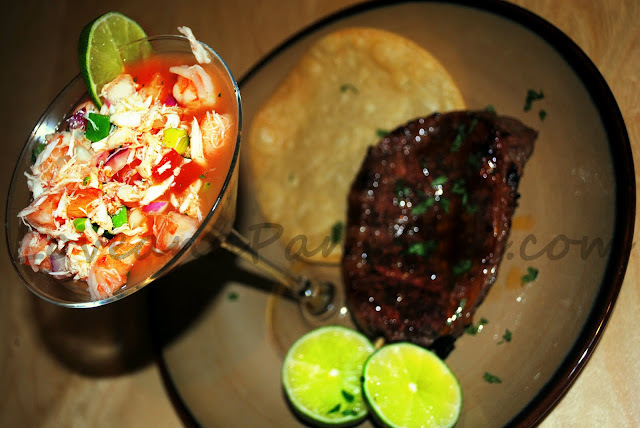 I love ceviche but my husband doesnt so only time I eat it is when we go out to a restaurant that serves it. I am drooling. Yum! There is a dish for pork that is "cooked" in the juices. I've eaten raw seafood since I was a child, so I would love to try this. Thanks! I had this for the first time awhile back. My friend is Cuban & she made it for us & used shrimp & crab. It's sooo good!